Carbon Fiber Material as one new machining material, which is widely used in the key ingredient in fiber-reinforced plastics and other composites. 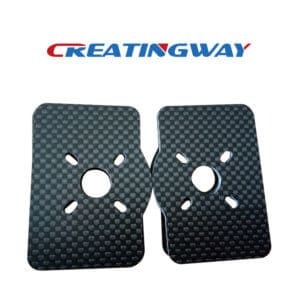 And for now, Creatingway has got many orders of carbon fiber from global customers. This seems to mean that carbon fiber will slowly enter into our vision and it is recognized by more and more people. At present, the carbon fiber material is main used in automotive & aerospace and Bicycle Industry as well as the others industries. Based on Carbon fiber itself advantage: it is nearly five-times stronger than steel, three times lighter, twice as stiff and have better yield strength, this make some designer or developers, particularly interesting to developers of high performance vehicles. They will fully use this composite material as an alternative to traditional steel material. Heat transfer and thermal expansion coefficient are small. And research shows that Carbon fiber will be a better choice for automotive and aerospace manufacturer to build vehicles. And it also will be expected to be an important machining material in other different industries in the near future. Although Carbon fiber material has obvious advantages, but it still has some lacking so that it can’t be widely used at this stage. It gradually bleached when placed in the sun. At the same time, manufacturer of carbon fiber requires a polymer precursor material that can have a certain effect on the quality of the carbon fiber produced. And these precursor material is very expensive, the chemical and mechanical process to turn them into carbon will take a lot of time, so the carbon productions are low than other materials. And for now, many developers are looking for a way that can replace the current precursors- using other materials. It may be hybrid fibers, glass or carbon etc. If succeed, I believe that low- cost carbon fiber will be a reality in the nearest future. It will rapidly develop into one of the main production material after the steel, aluminum. And have gradually occupies a position in Aerospace& Automotive industries. As one professional CNC Machining manufacturer. We’re thoroughly looking forwards to the Carbon fiber times coming. It will mean that we had entered a new times and had a new breakthrough.